While in Cebu, we took the opportunity to check out the famous Lantaw Floating Native Restaurant in Cordova. If you're a fan of Al Fresco dining, this restaurant is for you! Situated on the outskirts of Cebu City, this restaurant is a sure hit to locals and tourists alike with its succulent Filipino dishes and lively restaurant settings. From Crown Regency Suites in Lapu Lapu where we were staying, it took us about 30 minutes to get there because of traffic. The taxi fare is around 200 pesos. The restaurant's main open deck is magnificent at dusk! We ordered their pork sisig, lechon manok, garlic-buttered prawns, chopsuey, lumpia, and of course a big serving of rice. The food is good but it took over an hour to arrive. Their mango shake is a must try! We were so hungry, I totally forgot to take pictures of our food. Hence, I can only take a picture of the aftermath. If you want to make sure you get a table when you come, you should call them and make a reservation first. They get really packed with customers especially in the afternoon. If you are coming with a big group, chances are you won't get a table if you did not make a reservation. The best time to go there is at dusk when all the city lights are on. You'll get to enjoy the magnificent view from the restaurant's deck. Getting a cab on the way back to the hotel is quite easy. Just ask the restaurant staff to call a cab for you and they will happily oblige. You just have to pay 50 pesos on top of your metered fare. 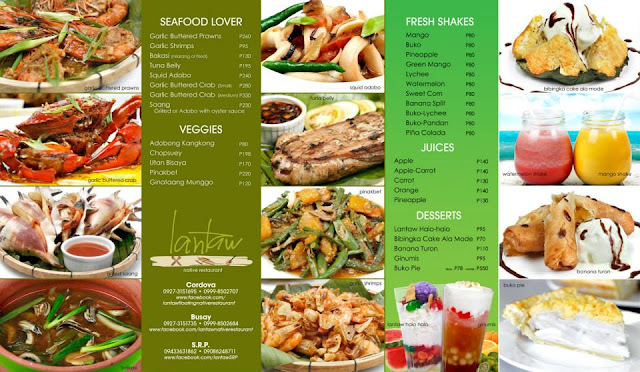 Lantaw Floating Native Restaurant offers good value for your money and also a fun way to experience Al Fresco dining in Cebu. Certified foodie. Crazy cat lady in training. ArmyNavy--It's a Burritoful World Indeed!